If you put together a well written brief for a new website and send it to 3 or 4 web agencies you will get prices so vastly inconsistent you would think they were all looking at a different list of requirements. We have been shown prices for as little as 20% of what we’ve quoted for the same features and functionality. Of course, the client has no way of knowing which quotes are unrealistically low or which are grossly over inflated. Before we get to the cost though, here’s something to consider. When you engage a developer, you are not buying a website. You are hiring a developer and paying for their time. The price you have been given is based solely on the amount of time the developer plans to spend working on your project. This is why purchasers need to be very careful accepting low quotes. > Design and Build: 50 hours minimum including project management, design, build, testing, upload and training. See the Functionality list below. > Ongoing Maintenance: $500+ year. > A Content Management System to manage your own content and as a base to develop the site on we generally use WordPress CMS. WordPress itself is free. The cost to install WordPress on a server, configure it properly, set it up with a basic template and minimum set of components (Akeeba Backup, JCE Editor, JSitemap, etc) and initial set of categories, content and menus will be around $1,200. > Events Management. To do events well takes a bit of planning. Despite what most people think, calendars are not user friendly. A well organised event list is a much better option. There’s generally multiple different views (daily, weekly, monthly as well as the actual event view) to layout and template and often clients want galleries or forms integrated directly into event pages. $1,500 to $2,500. > Document Management. It’s very easy to upload a file and link to it. Sometimes access needs to be controlled or a different document needs to be served from an existing link. $300 to $900 > Advanced User Access Control. Depending on requirements $300 to $1,500. > E-commerce through Shopify.com, Ecwid.com or similar. Setup, configuration, design, code, importing products and testing will cost around $7,000. > Contact Forms. Including antispam features and a formatted email to the user and site admin $300 per form. > SEO. On site SEO, set up of meta data and microdata and submission to search engines $1,200+ depending on the number of pages to optimise. > Social Media Integration. Set up, configure and template social media modules $600. > Backend integration with external systems like ERM, CRM etc needs to be assessed on an individual basis and may not even be possible depending on what we are integrating with. > Custom coded functionality will need to be assessed separately. The price will depend on the amount of time required to code and test it. Content creation is the single most underestimated task in development of a website. In 2011, I identified content creation as the number 1 cause of web project delays. These days, if we handle content it’s only to enter it and it’s treated as a separate project. Writing content takes a lot of time. Finding the right images is hard. Coming up with effective headlines and captions is an art. If you plan on doing it yourself, take what ever amount of time you think it’s going to take and multiply it by 10. Generally, we work on around 20-30 minutes per page just to enter content into a CMS. We need to enter it as plain text, space it out, format it with headings, bullet points, bold text and the like. Links in the text need to be set up and other articles usually need to be edited to link to the new page also. Images need to be resized, uploaded and positioned. A menu item needs to be created and modules positioned on each page. Then, it needs to be checked at various resolutions on different devices. If it takes 30 minutes just to enter a page of content how long do you think you’ll need to write it? Work on at least 4 hours per page of information. If you have a ten page site that could work out to about a full week of work. Budget $80/page for content entry. We highly recommend you engage a copywriter who has an understanding of copy writing for the web. You’ll need to put together a good brief for each page and supply as much existing marketing material as you can. Copywriters will get the job done well and usually much quicker than in-house staff. Budget at least $100/hour for copy writing. It’s always tempting to use off the shelf templates especially if you consider the cost of a template is around $40 where development of a new template costs upwards of $5,000 for planning, design and coding. The issue with templates is this. Templates are designed to sell themselves not your product or service. Too often the bling that makes a template appealing is the thing that gets in the way of a good user experience. As templates get more complicated they become harder to customise. When a customer comes to me with a site built on a template and needs changes I first need to learn how the template is setup and coded. Does it use template parameters for it’s configuration? Is it compiling from LESS files? Is it using a framework like Gantry or Warp? I may have to relearn the framework as they are constantly changing. Many of the features that sell templates are just html code entered into a WYSIWYG editor that gets broken at the first hit of a save button. Often functionality breaks as the code conflicts with other extension the client wanted. After 10 hours of hunting and pecking through another developers code, I find I need to purchase an account and download updates. In many cases it’s easier to rebuild from scratch using our own starter template and framework we use daily. But, the biggest problems with templates is the end result just isn’t as good as a custom design based on your branding and built with your content in mind. 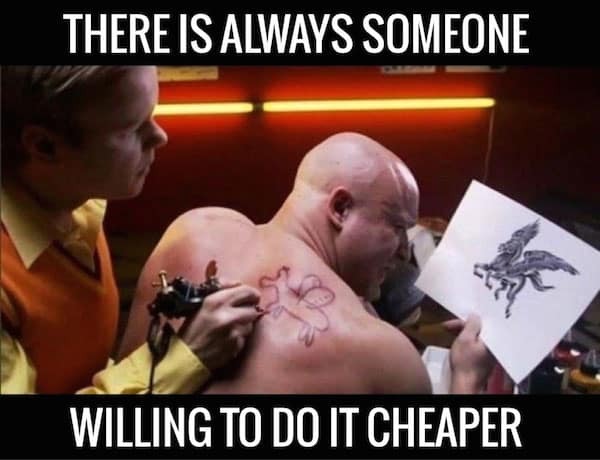 Please don’t request pre-built templates unless your budget is really tight and you don’t mind a few compromises. Budget $5,000 for quality graphic design and coding. When you have a free moment have a look at the web design awards site awwwards.com. You’ll see what is considered the best of the best in modern web design. Then have a closer look. What makes these sites so great? They are coded well, feature modern design, high graphical and technical standards. But, the one thing that truly sets these sites apart is the awesome photography. Even the simplest of website designs is turned into a masterpiece when great photography is used. That concept also works in reverse. A great design won’t make your blurry, dark photos look any better. For the best results, especially if you’re selling products, hire a photographer for a day. Budget up to $2,000 for a full day. No. I can’t work with what your friend/cousin/overseas contractor made for you. We understand you have something that mostly does what you want. We understand that you paid good money for it. Unfortunately, the reason your friend/cousin/overseas contractor can’t finish it for you or fix the bugs is because they’ve found out too late that they’ve approached the project incorrectly. In most cases when a project is “90% complete and just needs some bugs ironed out” it means starting from scratch. Seriously, we get several requests like this each month and as much as we’d like to put in a handful of hours and fix these apparently small issues it’s usually just not possible. It’s like building a house without a foundation, using cheap materials and unqualified workers. There’s no quick fix when your roof starts leaking and walls start cracking. Typically, a small business site will cost between $7,000 and $20,000. Complex larger sites can easily cost more than $50,000 especially if there’s a lot of custom functionality to code and test. Remember these prices are based on the time it takes to build. Cutting budgets means cutting time which ultimately means cutting features or cutting quality. There’s a reason most successful dot-com startups seek millions of dollars in seed funding. Good work takes a lot of time to get right.